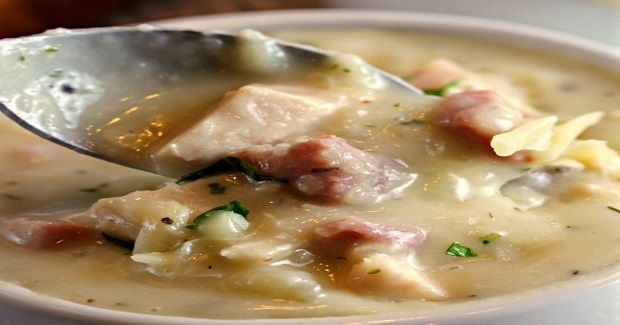 Chicken Cordon Bleu Soup Recipe - Gutom Na! Posted on Friday, July 29th, 2016 at 5:02 pm. Add diced potatoes, onion, carrot, chicken, ham, thyme, parsley, pepper, dijon & broth to a large pot. Bring to a boil and simmer 20 minutes or until potatoes are soft. Remove 2-3 cups of the potatoes/carrots and mash (try to avoid the ham/chicken if possible), then return the mashed mixture to the pot. Add milk and sour cream. Stir and cook an additional 5 minutes. Stir in shredded cheese until melted. Serve hot. Add diced potatoes, onion, carrot, chicken, ham, thyme, parsley, pepper, dijon & broth to a crock pot. Remove 2-3 cups of the potatoes/carrots (try to avoid ham/chicken) and mash, then return the mashed mixture to the crock pot. Add milk and sour cream. Stir and cook an additional 15 minutes. Stir in cheese and pepper to taste. Makes twelve 1-cup servings.